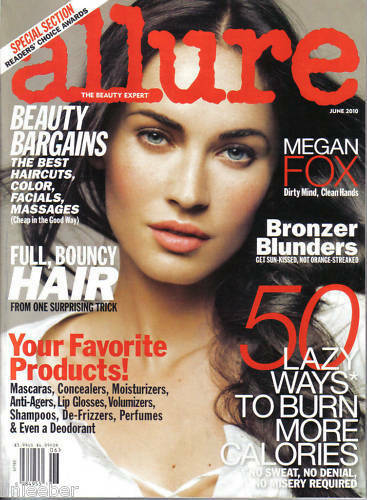 ALLURE JUNE 2010-MEGAN FOX; BURN CALORIES; BEAUTY BARGAINS Allure is the beauty expert. Every issue is full of celebrity tips and insider secrets from the pros, like what works overnight and what works for a lifetime. Editors pick their favorite new products and reveal what new styles really work for you. MEGAN FOX Dirty Mind, Clean hands BRONZER BLUNDERS ...Get skin-kissed, not orange -streaked 50 LAZY WAYS TO BURN MORE CALORIES ... NO SWEAT, NO DENIAL, NO MISERY REQUIRED BEAUTY BARGAINS ... THE BEST HAIRCUTS, COLOR, FACIALS, MASSAGES (Cheap in the ) SPECIAL SECTION ... READERS' CHOICE AWARDS FULL, BOUNCY HAIR ... FROM ONE SURPRISING TRICK YOUR FAVORITE PRODUCTS! MASCARAS, CONCEALERS, MOISTURIZERS, ANTI-AGERS, LIP GLOSSES, VOLUMIZERS, SHAMPOOS, DE-FRIZZERS, PERFUMES EVEN A DEODORANT NO ADDRESS LABEL! I combine shipping provide Online Tracking/Delivery Confirm COVER PRICE- US 3.99 Original Magazine That Was Issued JUNE 2010 That Has Been Read Only Once, So It Is In Easily In Very Good Condition. Shipping Will Be Done By USPS First Class/Media! Every Package Will Come With Delivery Confirmation Already Included! To see my book store with over 1,900 books, magazines, and other items, visit The Book Market: http://bonanzle.com/booths/bonzuser_pakme. To see my vintage and retro clothing: The Vintage Closet: http://bonanzle.com/booths/linleeber. My store has many adult and children's books, both new and old, hardcover and softcover, fiction and nonfiction. Check out my store for your favorite titles along with the hard-to-find books. I have some homeschooling books also. Let me know if you are looking for a special book. Chances are that I have it! I offer combined shipping!